Lymphangiomas are benign hamartomatous tumors which are characterized by abnormal proliferation of lymphatic vessels. They are lymphatic malformations which are localized to head and neck region. They are rare located in the oral cavity. Tounge, lips, buccal mucosa, soft palate and floor of the mouth are affected in the oral cavity. However buccal mucosa is infrequent in litarature. 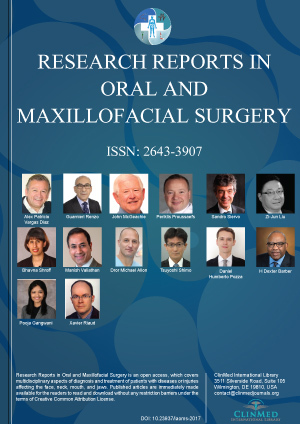 In this report report, a rare case of lymphangioma of the left buccal mucosa of retromlar area in a 30-year-old female patient has been treated by surgical excision is presented. Lymphangioma is a benign hamartomatous tumor caused by congenital malformation of lymphatic system. Lymphangiomas are usually present at birth, and aproximately 80% cases are present by age of 2 years. They are commonly found head and neck region. The most common area of head and neck reigon is the submandibular region and also parotid gland . The oral cavity can be affected by these lesions. They usually seen at the anterior two thirds of tounge followed by palate, gingiva, lips, alveoler ridge of mandibule and rarely buccal mucosa . Various treatment modalities have been used for the cure of lymphangioma. Surgical excision, radiotion, laser therapy, and sclerotherapy can be used for the treatment of lymphangioma  . 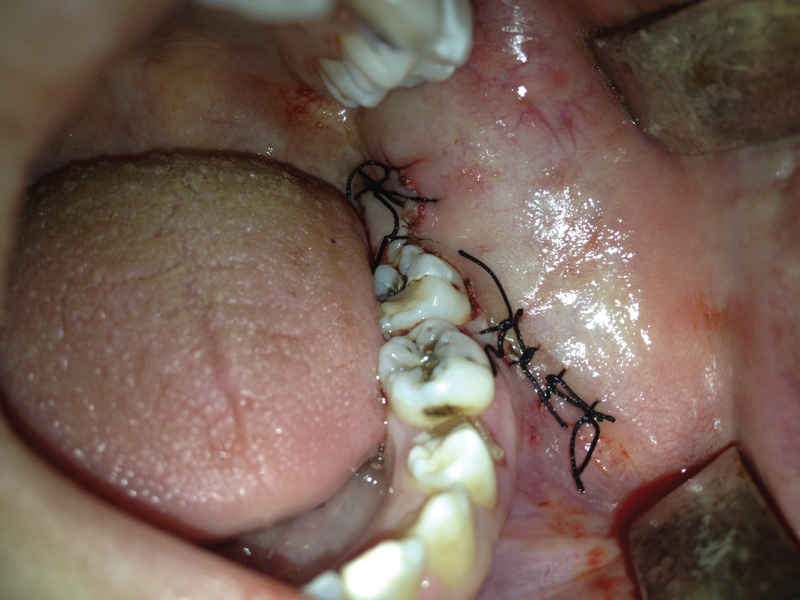 In this report, a rare case of lymphangioma of the left buccal mucosa of retromolar area in a 30-year-old female patient has been treated by surgical excision is presented. 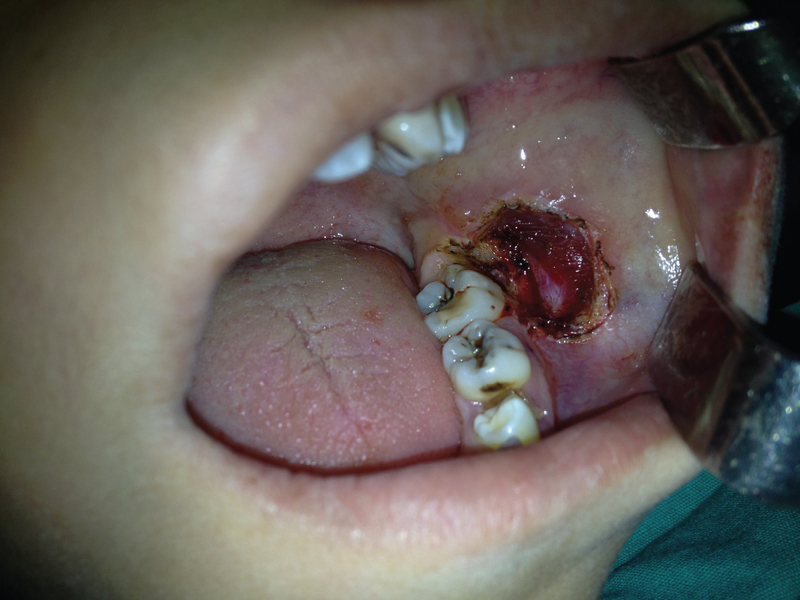 A 30-year-old woman was referred to the Department of Oral Maxilofacial Surgery with a chief complaint of growth and blisters on buccal mucosa of mandibular left retromolar region of and halitosis. Patient also complains discomfort during feeding. There is no systemic disease in the medical history of patient. 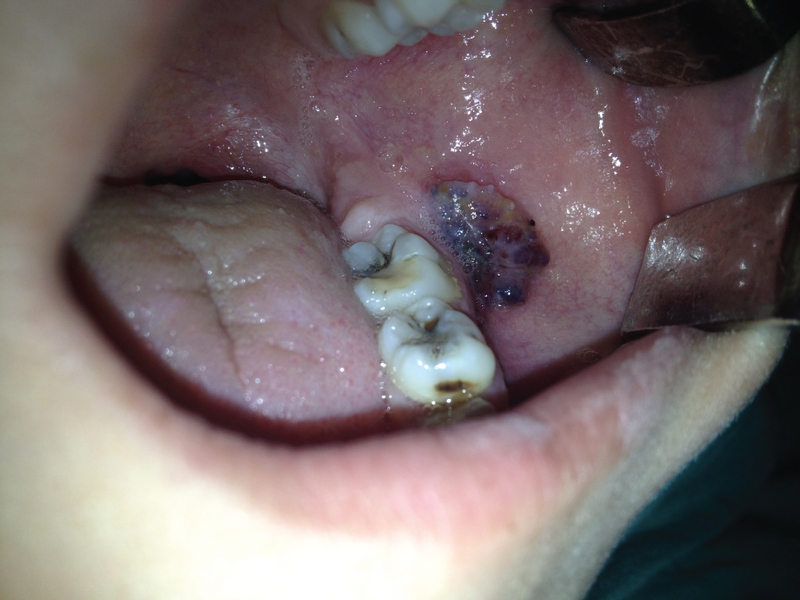 On intraoral examination, discolorization was seen in left buccal mucosa of retromolar region. The lesion was exophtic with color ranging from reddish purple to yellow was seen (Figure 1). On palpation, the lesion soft and nontender. Diascopy test was carried out which was negative. There was no evidence of adjacent bone and tooth involvement on orthopanthomographic examination. On the basis of history and clinical features a provisional diagnosis of lymphangioma was made and an excisional biopsy under local anaesthesia was planned. The lesion was excised by surgical (Figure 2) and wound was sutured primary (Figure 3). 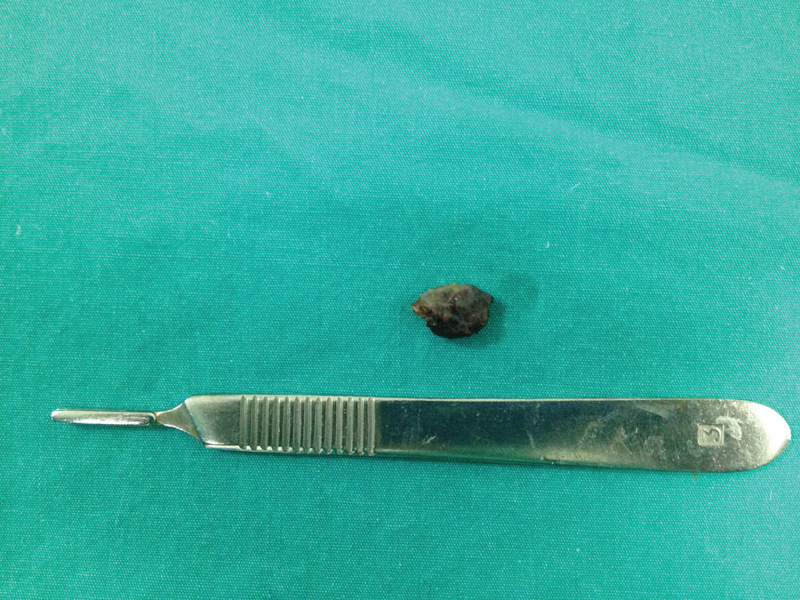 The excised lesion (Figure 4) was sent for histopatholigical examination and diagnosed as lymphangioma. 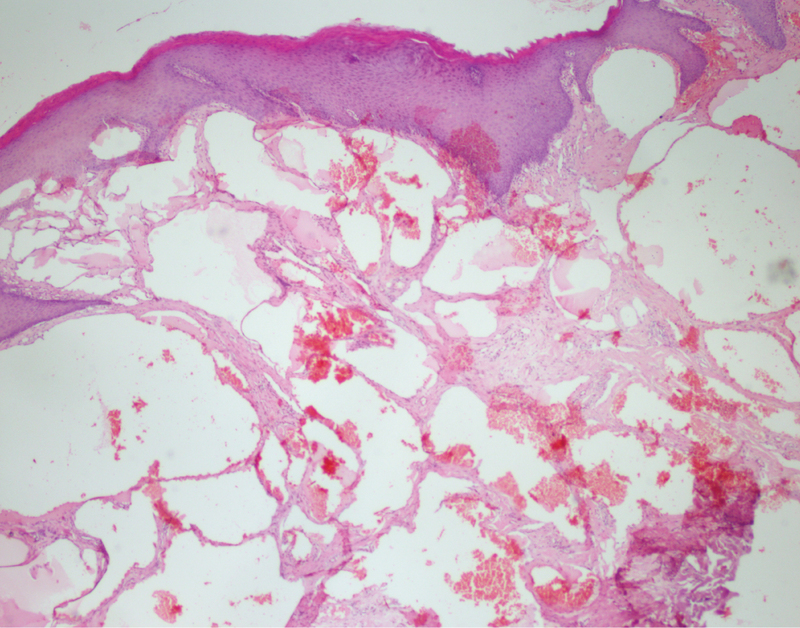 Microscopic examination showed numerous dilated lymphatics lined by endothelium (Figure 5) Some of the section revealed the precense of chanells filled with red blood cells (Figure 6). There were also many of accumulation of lymphocytes. 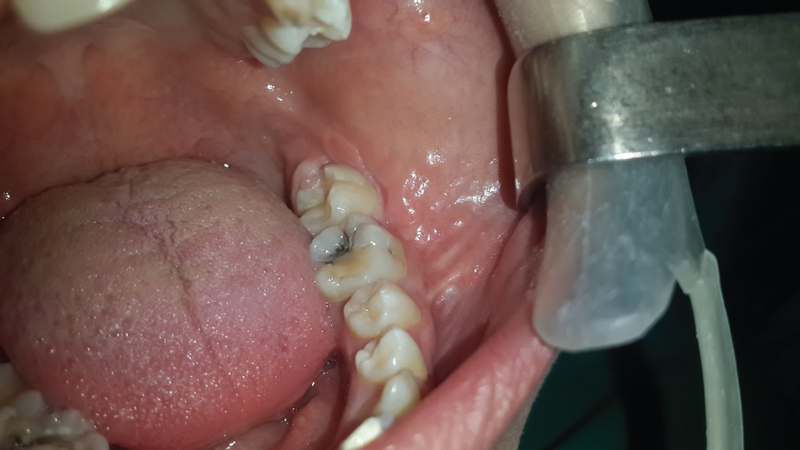 .The patient was discharged after 6 months (Figure 7) and 1 year with normal looking buccal mucosa . There was no evidence of recurrence of the lesion on follow up of 1 year. Lymphangioma is congenital vascular abnormality of the lymphatic system which is rare bening lesion. Lymphangioma was first defined by Virchow in 1854 . Several theories have been proposed for pathogenesis of lymphangioma. The first theory is that lymphatic system developes from five primitive sac arising from the venous system. Concerning the head and neck, endothelial outpouching from the jugular sac spread centrifugally to form the lymphatic system. Another theory proposes that the lymphatic system develops from mesenchymal clefts in the venous plexus reticulum and spread centripetally towards the jugular sac. Lastly, lymphangioma develops from congenital obstruction or sequestration of primitive lymphatic enlargement . These lesions are frequently reported at birth (60%) and 90% grow by 2 years of age. Lymphangioma is rare present in adults . In this case, a 30-year-old female reported. De Serres, et al. offered a clasification of the lymphangioma of head and neck based on of the spread the anatomical involvement . Lymphangiomas, aproximately 75% cases, are located in head and neck region. The oral cavity is rarely affected site including tounge, lips, buccal mucosa, hard and soft palate, gingiva . Tounge is commonly affected by the lymphangioma in the oral cavity. Brennan, et al. reported 49 cases of oral lymphangioma and 17 cases were located in tongue while only one case was placed at retromolar region and one at soft palate . Buccal mucosal lesions of lymphangioma are exactly uncommon in the litarature . Clinically, lymphangiomas are divided into three types which are microcystic, macrocystic and mix. Macrocystic lesions are larger than 2 cm, whereas microcystic lesions are less than 2 cm. Mix type is combining of microcystic and macrocystic types [9,10]. Morphologically, oral lymphangiomas are fairly typical. The superfacial types manifest a pebbly surface and vesicle-like feature with so called ‘frog egg’ apperance and gradually enlarge. The deep lesions usually present as submucosal mass. Histopatologically lymphangiomas are classified as: [11,12]. •	Benign lymphangioendothelioma (lymphatic channels appears to be dissecting through dense collagenic bundles). Treatment of lymphangioma alter their type, size, involvement anatomical structures and infiltration to surrounding tissues. Microcystic lesions are diffuse and difficult to remove in contrast macrocystic lesions are localized and easily excised. Various methots can be tried the treatment of lymphangiomas. Such as laser therapy, cryotherapy, surgical excision, sclerotherapy, electrocautery [3,13,14]. Oral lymphangiomas are common lesions occuring at the tounge and rarely at the buccal mucosa of retromolar region. Localized lesions can be treated by conservative surgcal excision with less recürrence rate. Therefore, the correct diagnosis and therapeutic indication of this type of lesions is crucial. 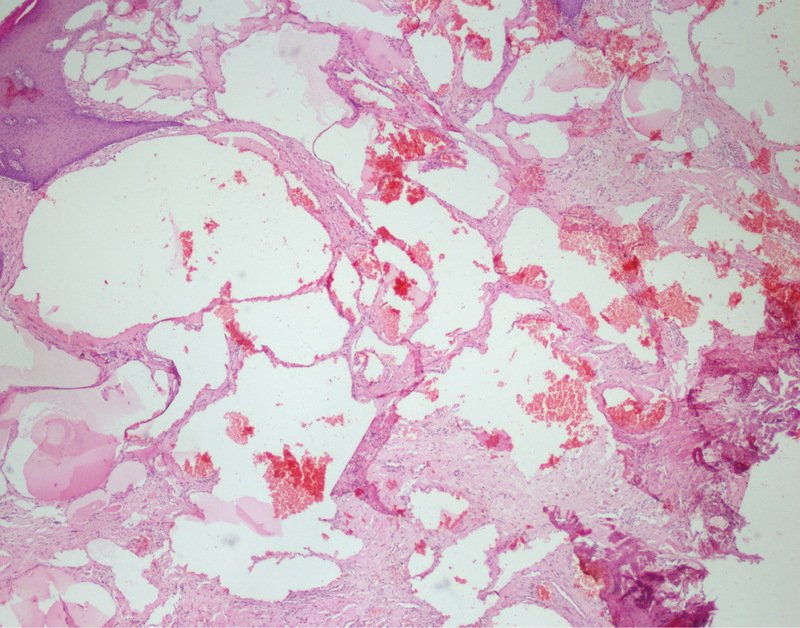 Mandel L (2004) Parotid area lymphangioma in an adult: Case report. J Oral Maxillofac Surg 62: 1320-1323. Ikeda H, Fujita S, Nonaka M, Uehara M, Tobita T, et al. (2006) Cystic lymphangioma arising in the tip of the tongue in an adult. Int J Oral Maxillofac Surg 35: 274-276. Balakrishnan A, Bailey CM (1991) Lymphangioma of the tongue. A review of pathogenesis, treatment and the use of surface laser photocoagulation. J Laryngol Otol 105: 924-929. Stănescu L, Georgescu EF, Simionescu C, Georgescu I (2006) Lymphangioma of the oral cavity. Rom J Morphol Embryol 47: 373-377. Sanlialp I, Karnak I, Tanyel FC, Senocak ME, Buyukpamukcu N (2003) Sclerotherapy for lymphangioma in children. Int J Pediatr Otorhinolaryngol 67: 795-800. De Serres LM, Sie KC, Richardson MA (1995) Lymphatic malformations of the head and neck. A proposal for staging. Arch Otolaryngol Head Neck Surg 121: 577-582. Brennan TD, Miller AS, Chen SY (1997) Lymphangiomas of the oral cavity: A clinicopathologic, immunohistochemical, and electron-microscopic study. J Oral Maxillofac Surg 55: 932-935. Bozkaya S, Ugar D, Karaca I, Ceylan A, Uslu S, et al. (2006) The treatment of lymphangioma in the buccal mucosa by radiofrequency ablation: A case report. Oral Surg Oral Med Oral Pathol Oral Radiol Endod 102: e28-e31. Leboulanger N, Roger G, Caze A, Enjolras O, Denoyelle F, et al. (2008) Utility of radiofrequency ablation for haemorrhagic lingual lymphangioma. Int J Pediatr Otorhinolaryngol 72: 953-958. Weiss SW, Goldblum JR (2001) Tumors of lymph vessels. In: Soft tissue tumors. (4th edn), Mosby, St. Louis, 955-967. Rajendran R, Sundaram S (2009) Shafer's textbook of oral pathology. (6th edn), Elsevier India, 146-148. Brad Neville, Douglas D Damm, Carl Allen, Angela Chi (1995) Oral and Maxillofacial Pathology. WB Saunders, Philadelphia, 395. Hellmann JR, Myer CM 3rd, Prenger EC (1992) Therapeutic alternatives in the treatment of life-threatening vasoformative tumors. Am J Otolaryngol 13: 48-53. Kennedy TL (1989) Cystic hygroma-lymphangioma: A rare and still unclear entity. Laryngoscope 99: 1-10. Nihat Lacin, Department of Oral and Maxillofacial Surgery, Faculty of Dentistry, Izmir Katip Celebi University, Izmir, Turkey, Tel: +90-232-325-4040. © 2018 Lacin N, et al. This is an open-access article distributed under the terms of the Creative Commons Attribution License, which permits unrestricted use, distribution, and reproduction in any medium, provided the original author and source are credited.